Many online portals have a section on Frequently Asked Questions (FAQs) where they answer questions that are asked by people visiting those portals. Similarly, in this blog post, we will answer ten questions that are frequently asked by businessmen who due to myths and misconceptions are apprehensive to the idea of social media outsourcing. 1. How does it save my time if I outsource my social media? Proper use of social media which ensures success requires time for planning and strategizing. You may not have time for all the planning and strategizing as you have to handle a lot of activities related to your core business. If you outsource your social media, Social Media Experts (SMEs) will plan, strategize and execute your social media activities and also prepare regular reports showing the data points and metrics of your social media success rate. This not only saves your time but will help you in concentrating on your core business. 2. How can I know that my reputation on social media is safe if I allow an outsider to control my social media pages? If you ask an honest and reputed social media agency to manage your social media account, they will show you their testimonials and the work they have done for their previous clients. These agencies sign a Non-disclosure Agreement (NDA) with their clients. You may also contact their clients and get a feedback. 3. All it takes is regular postings for popularity. How can my social media pages gain wider reach if I outsource the task of managing them? Postings cannot be created in thin air. They are created for the application of a strategy that aims to popularize the social media of client. Strategy is framed to suit the latest social media trends that change frequently. And total campaign to promote a business on social media goes way beyond creating posts and posting them. One strategy cannot benefit a social media page forever. You may not have time to follow the latest social media but SMEs are aware of 99% latest social media trends. Also, to reduce response time to queries and inquiries on your social media pages, you need a dedicated person to look into them regularly. 4. How to decide which agency is good to outsource? The answer written for Question 2 of this blog post answers this question. However, to see whether an agency is good – Try sending them a mail and see how long do they take to respond back. If they respond within 24 hours, this shows that they are serious about their business and they respect their potential and existing clients. 5. I can recruit an employee for social media activities or tell an existing employee to take out time and post two things on my page every day. What is the need to outsource? Your existing employee cannot plan a proper strategy and execute it properly if managing social media is an additional task for him/her. He/she may not be able to give sufficient time to social media because managing social media is a full-time job. You can recruit a full-time employee for all social media activities but you would have to invest time to train him/her. If you outsource your social media to a reputed agency, trained SMEs would be ready to take charge and manage your social media. 6. I know which social media channels are popular. Can I make one post and post it everywhere? Why outsource? This is a mistake. All social media platforms have different approaches. You can be casual on Facebook while talking to people there but on LinkedIn, you need to have a formal approach. You can post your LinkedIn posts on Facebook but Facebook posts cannot be shared on LinkedIn. Also, if you do not understand social media in depth, you cannot understand which social media would work for you. For example LinkedIn may solve your business purpose more than Facebook, but you may be paying more attention to Facebook. This would not bring positive results. On the other hand, SMEs can understand which social media platform will serve your requirement in a better way. 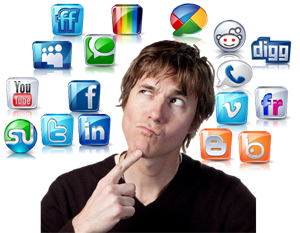 Therefore, they can help you with a right choice about social media platforms. 7. I am new to social media. My competitors have been using it for years. Will it serve any purpose if I outsource my social media to some outsider? If you are outsourcing your social media, you are not outsourcing it to just any “outsider”. You are outsourcing it to someone who is an expert in social media. If your competitors are faring well on social media just because they entered this field before you, social media experts can see their strategy and make a better strategy for your business so that your social media goals will catch up with your competitors within a short span of time. 8. How long will it take for me to gain popularity if I outsource my social media? Gaining popularity on social media is not like cooking Maggi noodles that get ready eat within two minutes. Strategy planning, making quality posts, running ads do take time. If you outsource it to experts, your goals can be met in a less time compared to the time that it would have taken, if managed by you independently. 9. Have I no time to track my social media? How will I track my progress and see if investing in social media is beneficial? A reputed social media agency will present a monthly report to you, describing how successful the social media campaigns are in different social media platforms and what are future strategies planned. These monthly reports will help you keep track of your success metrics and overall online progress. 10. Businesses use social media to advertise themselves and I have been advertising myself on radio, TV and print media. Do I really need social media? The cost of advertising on social media is far more nominal than the cost of advertising in newspapers, radio, and TV. If your business operates on a local level, then advertising on social media can be very beneficial for you. If you outsource your social media, SMEs can decide what type of ads would grab eye-balls and attract people to your social media page or your website. They can design such ads, leaving you time to focus on your core business. We have answered ten questions. If you have any other questions, feel free to ask us by posting them here in the form of comments.